...that the Unified Earth Government is headed by a president? ...that the Arbiter was originally called the Dervish, but this was changed to avoid being religiously offensive to Muslims? The cover of The Return by Rachel Beaudoin. The Return is the twelfth short story in Halo: Evolutions - Essential Tales of the Halo Universe. 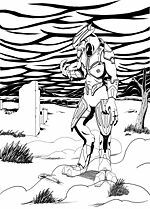 Written by Kevin Grace, this story follows a Sangheili Shipmaster as he travels back to the human colony world Kholo. This story takes place after the events of Halo 3 in which the Sangheili are no longer serving the San'Shyuum. The Return follows a unique writing style in which as the Shipmaster recalls past experiences, the text turns to italics to indicate a shift to a previous time period. The Return was adapted into a motion comic series by ONE, in the same vein as Midnight in the Heart of Midlothian, with the first part released on April 3, 2010 and the last part on April 24, 2010. The Shipmaster carving the Glyph of Faith onto Kholo's surface via glassing. Set six years after the end of the Human-Covenant War, a Sangheili Shipmaster returns to the glassed colony of Kholo in order to find forgiveness for his sins. He ventures lonely through the remains of the colony, occasionally remembering the glorious days of when he interrogated a human pilot and glassed the colony, as well as the dark days of the Great Schism. He experiences flashbacks where he showed his loyalty to the Prophet of Conviction by glassing Kholo. During the process, the Shipmaster marked the Covenant glyph representing "Faith" on the surface of the planet. Years later, when the Jiralhanae betrayed the Sangheili over High Charity, the Shipmaster confronted the Prophet of Conviction and disarmed him. The Shipmaster then exposed the Prophet's deception and killed Conviction in front of his crew. In the present timeframe, after several days of searching, he discovers Kig-Yar pirates fighting humans at an excavation site. After killing the Kig-Yar, he finds a lone human survivor. Realizing the survivor would soon be dead, the Shipmaster leaves him and continues looking around the base. Soon, he finds photos of humans interfering with Forerunner technology, including what the Shipmaster remarks as resembling an Oracle that once existed in High Charity. [note 1] Realizing this could be what he was looking for, he returns to the human survivor and calls for help to save him. If the human manages to survive, the Sangheili plans on questioning him in order to collect information on his studies. The Zune Video Marketplace logo for the motion comic. Human research of a Forerunner Monitor. A still from the motion comic. ↑ This may refer to either the Mendicant Bias fragment aboard the Forerunner Dreadnought or 343 Guilty Spark, who was also held in High Charity for a time.